The Yosemite Haus is Just 14 beautiful miles from the Southgate of Yosemite and the giant sequoias, 7 miles from Bass Lake and 7 miles from downtown Oakhurst. You will absolutely fall in love with this Beautiful home, located in one of the areas most popular location. Views, Tranquility and close to everything. Free WiFi and Netflix! The Yosemite Haus is ideally located Just 14 scenic miles from the south gate of Yosemite National Park and 7 Miles from Bass Lake! This is the perfect family vacation or weekend get-a-way location. You will experience the convenience of being close to everything, but yet set back just enough to enjoy some Peace and quiet, spectacular views, and fresh air. The spacious balcony deck will be your source of relaxation under the stars after a long day of wonderful adventures in the local area and park. 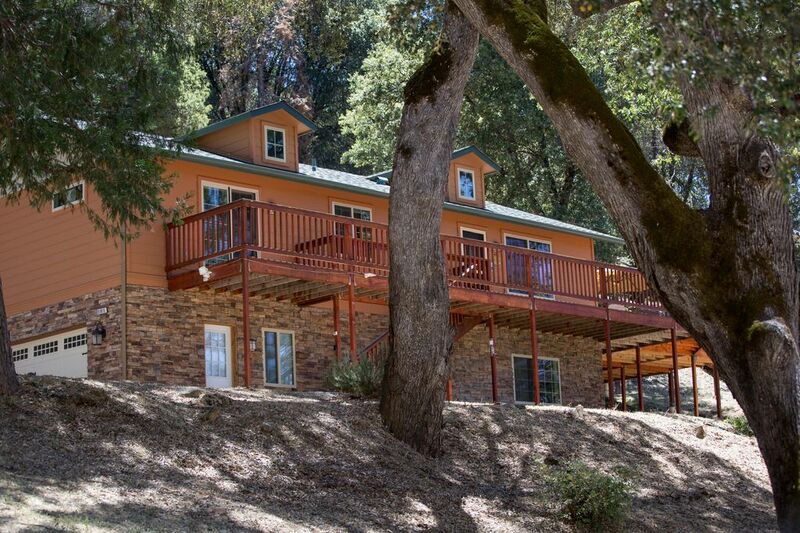 With 3 bedrooms, 2 bathrooms, room for 6 guests, magnificent views from the deck and an astounding location near one-of-a-kind entertainment and recreation, this charming "home-away-from-home" vacation rental in beautiful Oakhurst, California is perfect for your next California getaway! Upon your arrival, you’ll simply fall in love with the property's wonderfully tranquil environment, encompassed by marvelous wooded scenery, awe-inspiring wildlife, and uninterrupted peace and quiet in every direction. Built in 2009, the home's interior is equally as comforting, adorned throughout with tasteful alpine decor and elegant furnishings. Everything you need to feel as comfortable as possible is here, including heating and air conditioning, in-unit laundry machines, 2 TVs with satellite service, and wireless internet access to help you stay connected. You will be amazed by all the amenities! Look forward to starting your vacation mornings off with a hot cup of coffee outside on the expansive deck, where you can relish in the invigorating morning breeze and admire breathtaking views of the Sierra Mountains in the distance, covered by regal ponderosa pine, cedar and oak trees. Embark on an adventure to explore the boundless natural beauty in the area before returning home to unwind in the immense comfort of the spacious living room. You’ll love being able to lounge and dive into that good book you’ve been meaning to read while the kids have hours of fun challenging each other to games of ping pong and foosball in our huge, brand new game room! While this house is ideally located away from the hustle and bustle of busy daily life, it's also conveniently situated near all the excitement you could possibly want. Make a short 7-minute drive over to Bass Lake for a day of fishing, hike the trails of the Sierra National Forest, and 7-short minutes to Oakhurst for any amenities you may desire, or explore the grandeur of Yosemite National Park, settled less than 14 scenic miles away from the property. Here you’ll find awe-inspiring beauty at every turn, from historic Sequoia trees and magnificent waterfalls to the famous Yosemite Half Dome Mountain, which is featured on the California quarter. Take time to hike the numerous trails just minutes from our location. My wife and I settled on the Central Coast of California after a 10 year of military service. We have two adult children and five grandchildren, who we enjoy spending most of our time with. In 2001 we traveled to Oakhurst, California, for the first time and immediately fell in love with the area. The first thing that appealed to us was the friendly people and the relaxing atmosphere this area provided. We are outdoor enthusiast who enjoy camping, hiking, boating, sightseeing, and areas that are unique with culture. We enjoy traveling in the United States and abroad. The first thing that appealed to us was the friendly people and the relaxing atmosphere this area provided. As we explored the area a little more, we were impressed with how much the local area had to offer. With Bass Lake and Yosemite National Park nearby, we quickly realized this one area had so much to offer for anyone. Whether it is snow skiing, water skiing, boating, hiking, sightseeing, or just the relaxation this beautiful area has to offer, your experience will be sensational. This property is designed to help protect our most valuable resources, and the beauty that California and the Yosemite area have to offer.. Reducing, Reusing & Recycling From recycling to installing high efficiency systems, we’re reducing our impact on the environment by reusing wherever possible. We practice extensive waste reduction and recycling of glass, paper, and cardboard, metal, plastic and ceramic. These efforts have reduced our waste significantly, the majority of which is now recycled. Water Reduction Practices To conserve water, one of California’s greatest natural resources, we have taken several steps to reduce its usage here at The Yosemite Haus; we have installed low-flow toilets and plumbing equipment. We also personally conserve water and encourage guests to do the same by doing such things as turning faucets off when not in immediate use and asking guests to consider using their linens more than once. Smoke Free Environment For the health and comfort of our guests and the health of the environment, Yosemite haus is a smoke-free environment. Compact Florescent Bulbs and fixtures Our change from incandescent to compact florescent bulbs in over 75% of our fixtures has reduced our energy usage significantly. Centrally located between the Bass Lake Community, the town of Oakhurst, California, and the Yosemite National Park. The house is located 55 minutes from the Fresno Yosemite International Airport, which offers 6 major car rental companies to serve you. It is located 20 minutes from a beautiful casino resort, which offers live shows, gaming and buffet dining. There is local wine tasting, beer tasting from the Southgate Beer Brewery in the town of Oakhurst, California, golf courses and the Yosemite Park Zip Line attraction. This property is centrally located close to all amenities, but just off the road enough for you and your family to enjoy beauty, privacy, relaxing peace and quiet. This house provides two full bathrooms. Each bathroom has an exhaust fan. The guest bathroom is centrally located for easy access with a large walk in shower and toilet. The large 60' long sink counter top makes storing personal items and your morning preparation comfortable and hassel free. Each bathroom provides towels, toilet paper and a starter set of toiletries. Centrally located to Yosemite National Park and Bass Lake. Just 7 minutes from downtown Oakhurst and nestled in the Sierra mountain foothills for the perfect family or romantic getaway weekend. Clean! Located on the edge of a nearby town, to help you relax and enjoy natures beauty. Located Just 7 Minutes from downtown Oakhurst! Beautiful view of the Sierra National Forest with ponderosa pines, cedar trees, and oak trees. Cell service available through most providers. Dinning room kitchen nook seats six. Beautiful Views! with a gas grill, tables, and chairs. Great way to enjoy a relaxing evening under the stars after a full day of adventures in the Yosemite area. Free use of a Telescope upon request. (Kayak) Free use for guests only. Great way to enjoy a day at the Lake! Due to the local terrain and the requirement to use stairs to access the living area, it would not be recommended for persons with wheelchairs or persons who would have medical restrictions for climbing stairs. We stayed two nights here with our family of 6. There was plenty of room for everyone and our children loved the game room downstairs. Home was very clean and well stocked. Beds were very comfortable! A bit farther from Yosemite Valley than we thought when we booked it- about 1.5 hours to get to the main Attractions like Yosemite Falls, Half Dome, and Bridal Veil Falls. We planned accordingly and wound up eating dinner both nights we were there in the little downtown area about 15 minutes away. We loved the house! Everything we need was provided. Clean, nice house! What an amazing home! We (5 of us) stayed 4 nights in this beautiful home. Immediately upon entering, you quickly notice how spotless this place is. The game room was a huge hit for our family. Playing ping pong every night and ladder ball in the days. The views are incredible from their balcony. Deer is everywhere in the mornings. It was a quick 20min drive to the Yosemite entrance. The owner is very responsive, and always very friendly. They left candies and drinks in every room upon arrival. They definitely make you feel welcome. I highly recommend this home. We'll definitely be returning in future years. Thanks for making our Oakhurst/Yosemite experience amazing! Excellent home that large, comfortable and well equipped. We thoroughly enjoyed our stay! Beautiful and relaxing. Unexpected two days of light snow just added to our enjoyment. We were still able to get around thanks to plowed roads and explore the area (unfortunately Yosemite was closed because of the weather, but we'd definitely come back for that). The home was welcoming, comfortable and well outfitted. An absolute gem! We enjoyed an amazing stay for this winter. The house is perfect for a family - we had 4 adults and 2 teenage children and were extremely comfortable. The beds were great - my son even commented that it was better than his own! The best part was that it was decorated for Christmas - a tree, lights, and all!!! We really enjoyed the fireplace....it has a remote and keeps the living room toasty warm. The appliances are so quiet and top quality. And the game room made for some nice family fun. Only a few things we would suggest - a lock on the main bathroom would be nice, I wasn’t able to find the Keurig or waffle maker (both listed in the amenities, but seriously no big deal), and the TV quality wasn’t great. None of those items really mattered - still a 5 star rating for sure. While we didn’t spend too much time on the deck because it was winter, it was beautiful and we spent as much time as we could handle the chilly weather - sunsets and star gazing were amazing! The owner really takes a lot of pride in this property and it shows - you feel right at home almost instantly. Enjoy Bass Lake where you can swim, boat, fish, picnic, BBQ and relax. There is a rental facility with choices of boats, paddle boats, patio boat (basic, luxury, and super luxury), super luxuary patio boats (includes BBQ pit, am/fm radio, ice chest, padded lounge seats, table, sun shade, swim ladder, anchor, safety vests, boat tow hook, and tow hook for skiing and wake boarding), professional lessons for water skiing and wake boarding, ski boats, wave runners, tubes, bannana tubes, fishing boats, kayaks, canoes, standup paddle boats. Enjoy the lake as the famous Scottish-American naturalist, John Muir, did many years ago. Yosemite National Park offers sight seeing, hiking, snow skiing, picnicing, and golfing. Yosemite offers an inside look of the natural wonders and history through self guided tours or professional guided tours. No Refunds for special rate periods of 04-01 to 12-31- 2018. No exception.